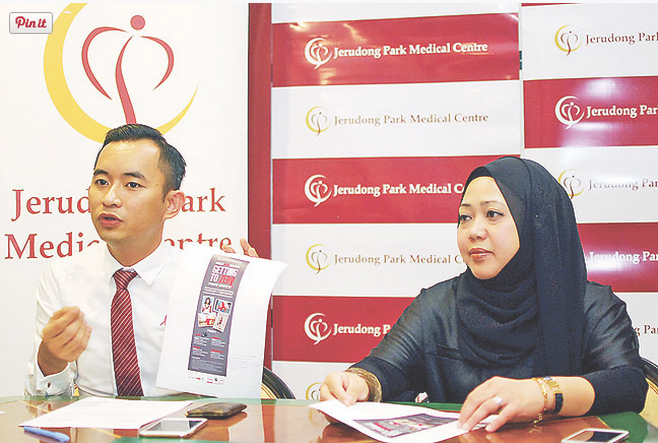 A BRAND new SLR camera as well as cash prizes are among the attractive prizes awaiting the winners of the Photo Contest organised by the Jerudong Park Medical Centre (JPMC) in collaboration with Brunei Press Sdn Bhd to mark the World AIDS Day which falls on December 1 every year. Details of the contest were revealed yesterday in a press conference hosted by Ak Danny bin Pg Tajuddin, JPMC Marke-ting Officer and Hazizah Osman, Deputy General Manager of Brunei Press Sdn Bhd. The prizes included a Canon EOS 700D Kit (18-135mm), BND500 cash prize, a one-year JPMC gym membership as well as Canon accessories such as cap and power bank. Second prize winner will walk home with a BND300 cash prize and six-month JPMC gym membership along with Canon cap and power bank. Third place winner will be presented with BND200 and three-month JPMC gym membership as well as Canon cap and power bank. The fourth and fifth place winners will each receive BND50 and one-month JPMC gym membership along with Canon cap and power bank. Interested individuals have to submit a picture that is at least 300dpi in size and the image should be related to the theme of World AIDS Day, ‘Getting To Zero and Represent Healthy Lifestyle’. There is no entry fee and the contest is open to all Brunei residents except for JPMC and Brunei Press staff members. The contest will start today and will end on December 9. Participants need to email their photo to marketing@jpmc.com.bn with their full name, IC number and contact number. “This year the World AIDS Day 2014 carries the theme “Getting to Zero”. This time around we will be featuring a photo contest based on that theme which would also present the essence of a healthy lifestyle,” said Ak Danny. This is the second time that JPMC and Brunei Press have collaborated in an activity to raise awareness on HIV and AIDS. This year’s photo contest event is supported by Manning Jaya Trading (B) Sdn Bhd, Interhouse Company, Mc Quipp Technisell Marketing Sdn Bhd and Medicorp Sdn Bhd. The result of the contest will be announced in the Borneo Bulletin and Media Permata newspapers on December 13. Meanwhile, in the recent statistics provided by Brunei Darussalam AIDS Council (BDAC), there have been a total of 93 cases of HIV recorded till the end of 2013. The highest annual increase was in 2013, with 12 cases detected. There were a total of nine new local cases of HIV reported in 2012. By the end of 2013, there were 63 individuals with HIV in Brunei while four AIDS-related deaths were recorded.